Before we left California, I had grandiose visions of driving all the way up the Dalton Highway to Prudhoe Bay, Alaska and watching polar bears stroll into town. After a bunch of reading, and talking to some people who had been there, we decided that maybe we shouldn’t attempt that long of a drive (it’s over 500 miles from Fairbanks) on a road that could have pretty nasty conditions. We were nervous about damaging our truck (we heard the road could be REALLY nasty!) and since it’s our only way to get around and to move our “home away from home” we felt like we should be a little bit cautious. But, once we got to Fairbanks we started doing a little research and realized that there were several rental car agencies that you could rent a truck or car that was equipped with a CB radio, an extra tire, and tools in case of emergencies on the Dalton Highway, and they let you take their vehicles up to the Arctic Circle. So, that’s what we decided we’d do. This satisfied me for two reasons: 1) I just wanted us to be able to say we’d been to the Arctic Circle (superficial, yes, I know.) 2) This summer, I’m reading Julie of the Wolves, by Jean Craighead George, with the kids and it takes place on the North Slope of Alaska, up above the Arctic Circle. I really wanted them to actually see and experience what it would have felt like to be where Julie lived. So….field trip and life experience in one big day trip! Wahoo! The Dalton Highway was constructed as an access highway for the crews building the Trans-Alaska Pipeline. It was interesting to see the pipeline snake back and forth across the tundra, and above and below the ground in areas of permafrost. The other thing that really surprised us was the quality of the road. We were expecting it to be horrible…so horrible that we paid to take someone else’s truck! But, we actually found it much better than we anticipated, and in hindsight, we wish we would have taken our own truck. 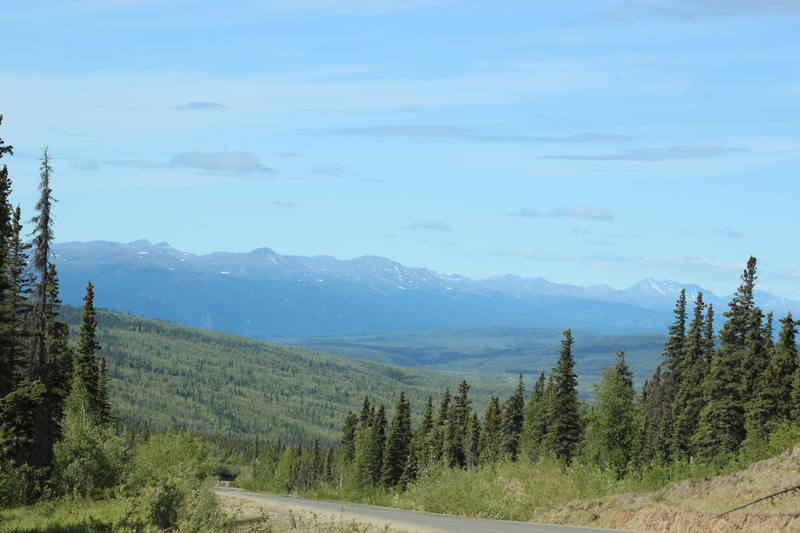 There were areas of the Alaska Highway that were just as bad, and we drove those while towing a trailer. So, live and learn, right?! Maybe, I’ll be able to convince Corey to take me back to see those polar bears after all?! We made it to the Yukon River Bridge, JUST in the knick on time, because it had been closed for several hours due to road construction. Then, we headed over to the Yukon River Visitor Center, and visited with a wonderful Park Ranger and her husband. Thankfully, they had a nice warm fire going in their wood stove, so we could warm up after our brief walk outside. It had snowed on our drive over one of the mountain passes on the way in earlier in the day, and when we reached the River at 11:30am, it was only 40 degrees, and the wind was howling! We braved the chilly temps as best we could (for the photo op!) and raced back to the truck! Another quick stop at Finger Mountain, where we took a short walk to a vista overlooking the tundra and some rocky outcroppings, and then, we finally reached the Arctic Circle. The big kids and I took some time out for a science lesson to understand what makes the Arctic Circle unique, before we headed home. I’d hate to say the Arctic Circle was underwhelming…it’s a memory I’ll hold forever. I’m totally glad we went, even if it was just a signpost and a few interpretive boards. And, part of this whole adventure is learning that life is not just a destination, it’s a journey. Each part of the journey has something it can teach if we’re open to learning. Catch you after the next adventure!! I love your adventure! Thank you for bringing me along! I love you ALL! Previous Previous post: Moose, and Caribou, and Bears! Oh MY!! !